This is a beautifully drawn Bible chart of the timeline of human history, past, present and future, as found on Brother Rodney Beaulieu’s church website located in Newington, CT. Grace Bible Community Church. The universe itself pivots upon the cross. Very basically speaking, the Bible can be divided in to four main sections. Genesis 1 – 11… creation, the catastrophic worldwide flood and the establishment of all nations via the confusion of language. Genesis 12 – Acts 28… the rise (Gen 12:1-3) and fall (Acts 28:28) of Gods chosen nation Israel, the old covenant (Law of Moses) given to them and the first coming of Christ, Israels promised Messiah to earth. Prophesy spoken since the world began. Romans – Philemon… the saving of Paul, the revelation of the mystery kept secret since the world began, the formation and eventual translation of the heavenly “mystery church” the body of Christ. God has reconciled Himself to all men of all nations where the saved man is His ambassador; yet the evil course of this world continues with satan, the god of this world imitating and counterfeiting the Creator God via religion and politics. Hebrews – Revelation… anti-christ revealed, the future rise and rule of believing Israel over earth as the new covenant with Israel written in Christ’s blood is established (Heb 8-10); the wrath of God once again poured out (great tribulation) and the second coming of Christ to earth to judge all nations (based upon Gen 12:1-3). The Kingdom on earth established with the “sheep” nations entering in and the “goat” nations eternally damned (Mat 25:32-46). 1,000 year rule with Christ on the throne in Jerusalem. satan loosed one last time. Armageddon. Great white throne judgement. Prophesy spoken since the world began. Eternity (Eph 1:10). The Bible is a book pf progressive revelation. Again, since this is a summary type page, God provided man with the knowledge he needed over the course of human history. As a literary (not literal) example of this it can be thought that God gave the “who” and the “what” to the prophets of old. He gave the “where“, “when” and “how” to the twelve apostles. God gave the “why” of everything, He explained it all to the Apostle Paul and that is whet we find in Paul’s epistles. Without understanding who Paul is to us today, we are destined to misunderstand what God is doing today. Paul is to believers today as Moses was to the Jews of yesterday. Every verse in the Bible must be examined in three ways or we will not understand it fully. The historical context must be understood. The spiritual context must be understood. 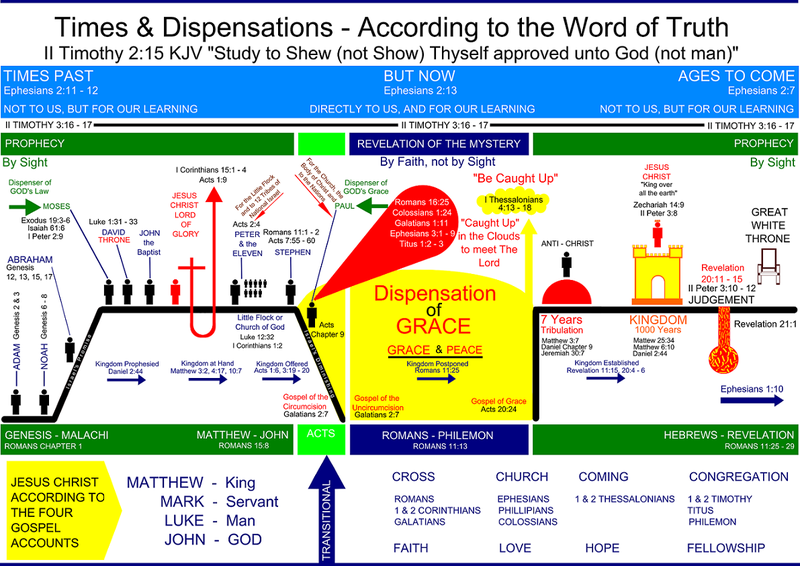 The dispensational context must be understood. Lastly, the Bible is arranged in a parenthetical pattern. For example: as any sentence can be constructed to make a point (diverge from that point to make another) and then sum up the original; so is the Bible physically laid out. Genesis through Acts – (Romans through Philemon) – Hebrews through Revelation. No covenant – old covenant- (no covenant) – new covenant. Can I purchase this chart from you? Greetings Robert! I’ll be happy to send you several for free. One for you and a few to share. Email me at GraceCountryBibleChurch@yahoo.com with your physical address and I’ll get them in the mail ASAP along with a few of our Bible tracts. Hi Beverly… please pardon my days late reply. I attempted to use my phone but failed to log in properly… ah, technology. I’ll be happy to send a few fold out charts and Bible tracts your way. I’ll also include a copy of Justin Johnson’s wonderful book “Start Rightly Dividing”. I’m very glad you found our site and hope you feel free to engage any time with questions that might arise during your studies. I’ll always try to answer to the best of my understanding resting solely on scripture to support my position. Hi Niki, so very glad you found us! It’s amazing is it not, when the lights start to come on and all those puzzle pieces start to fall perfectly into place? Contradictions that exist become rather easily understood if we follow Paul’s advice to rightly divide the scriptures. To learn more about us feel free to contact me directly via email or by phone. Both can be found on the contact us page. Be sure to let me know your location; we are in McKinney Texas. If you are near us please do come for a visit and some fellowship around Gods word. Amen on your salvation and amen on your coming to understand the truth. I would also love a bible chart, I am so thankful I found this site, it is so helpful , in understanding the Bible. I live in Canada , my address is T Watts Apt 202 2908 Hopkins Rd., Prince George BC Canada V2N 1L5. Hi Thelly! I’ll get a chart out for you and a couple to share with friends and family! Will include a few of our GCBC tracts as well. Please don’t hesitate for a moment to use the “got questions” page or to contact me directly with any scriptural questions. I do by best to reply quickly and in the best way I know how.